DoS (Denial of Service) attacks against Web services make them unavailable for legitimate users, affecting the website owner’s potential business. These involve intentional consumption of network, CPU and memory resources. In this article, I will demonstrate how to do a SYN flood using the SCAPY framework, along with other preventive measures. Over time, DoS attacks have become more complicated, concealing malicious client requests as legitimate ones. Also, a distributed approach, the DDoS (Distributed Denial of Service) is now being adopted, which involves generating multiple requests to create a flood scenario. One type of DDoS flood attack is the TCP SYN queue flood. A SYN queue flood attack takes advantage of the TCP protocol’s “three-way handshake”. A client sends a TCP SYN (S flag) packet to begin a connection to the server. 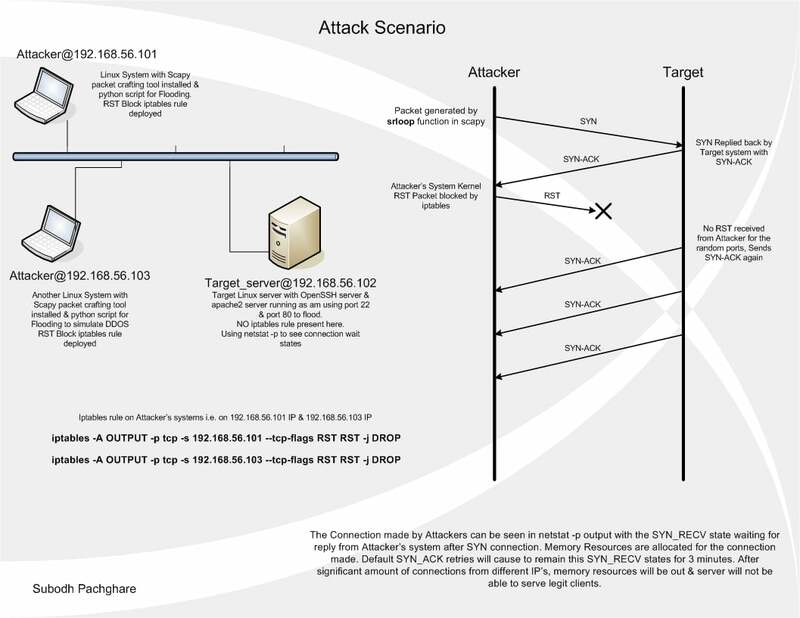 The target server replies with a TCP SYN-ACK (SA flag) packet, but the client does not respond to the SYN-ACK, leaving the TCP connection “half-open”. In normal operation, the client should send an ACK (a flag) packet followed by the data to be transferred, or an RST reply to reset the connection. On the target server, the connection is kept open, in a “SYN_RECV” state, as the ACK packet may have been lost due to network problems. In a DDoS, multiple attackers make many such half-connections to the target server, in a storm of requests. When the server’s SYN buffer is full with half-open TCP connections, it stops accepting SYN connections, thus resulting in denial of service to legitimate clients. server” VM. In a real-life scenario, attackers target a server on ports that are in the LISTEN state, to bring down the service. My three Ubuntu Server VMs are connected through the VirtualBox “Hostonly” network adapter. The target server is 192.168.56.102; 192.168.56.101 and 192.168.56.103 are the attackers. I am using Scapy 2.2.0. Going forward, extract the Scapy source, and as the root, run python setup.py install. Run Scapy with the command scapy. Note: This rule will DROP packets from the OUTPUT chain that have the RST flag set. The iptables rules will only apply to the kernel stack layer, not the application layer — so it will not apply to packets generated by Scapy, which creates the entire packet in its space. However, the malformed/manipulated packets crafted by Scapy will be seen by the kernel, which will send RST responses (resets) to the target, since it (the attacker’s kernel) didn’t initiate this TCP communication. To prevent this, we should use the above iptables rules, so that the kernel’s RSTs will not get to the target — otherwise, the target’s SYN buffer will not get full, and the DDoS attack will fail. Run the Python script (below, SYN_Flood_Scapy.py) in the attacker VMs to send malformed SYN connections to the target. Figure 2 shows the Scapy SYN packet output at the shell prompt. As you can see, this script will take the destination IP as input, and will create connections from different ports. Random custom field values are used for TTL (Time to live) and ID, to obfuscate the identity in case any IDS/IPS (Intrusion Detection System/Intrusion Prevention System) is present at the target side. Every OS has typical TTL values (e.g., Windows 128, Linux 64, etc. ), which any firewall or IDS/IPS like Snort can use to detect the attacker’s OS version. The randshort() function is used to generate random port numbers for the sport (source port) of the TCP packet. The destination port (dport) is set to port 22 (SSH) and 80 (Apache Web server). The TCP connect flag is set to SYN using the flags option. The srloop function sends p crafted packets at intervals of 0.3 seconds. The results of srloop are collected in ans (for answered packets) and unans (for unanswered packets). The gathered results are displayed in a table format for the reply flags and TTL values. Finally, the script reports SA (SYN-ACK) responses, and gives the results as answered/unanswered packets. The target’s reply of SA shows that it “thinks” the ACK from attacker/initiator was lost; hence, it keeps re-sending it, for an interval specified by the kernel. The connection, on the target server, remains in the SYN_RECV condition for 3 minutes for each port, as per the net.ipv4.tcp_synack_retries parameter, which is set to 5 in Linux. After these retries, the kernel closes the connection. Here is the seed of a SYN flood. Millions of unanswered SYN requests to the target server can fill the buffer up completely, leaving it unable to serve legitimate clients. Now let’s look into custom prevention methods. As a prevention measure, I created a shell script to generate iptables rules, which will be purged automatically on exit from the script. This solution will reject all suspicious TCP connections with a TCP RST packet, to prevent potential DDoS. All connections in the SYN_RECV state will be closed forcibly with RST packets. I allow 25 attempts from a single IP address, to take care of packet loss, which sometimes does happen, due to network errors. Thus, legitimate clients have a chance to reconnect. After 25 attempts from the same IP address, SYN packets from that IP address will be rejected as intentional flooding (an iptables rule entry is added for malicious IP addresses, to REJECT with a TCP RST flag), and it will be logged for tracking purposes. The time interval at which to check for connections has to be specified (the script will sleep for the given time interval). If the server has a significant load, lower intervals are better, for more frequent scans. This will also log the number of connections made from each IP address, for further analysis. The script can be terminated with the EXIT signal. It uses a while loop with the continue jump statement, so that existing IP address rules will not be re-entered. The EXIT signal (^C) will cause the script to flush all iptables chains, and clear all the rules it added. The topology diagram is in Figure 3. So, this is what you need to know to prevent a SYN queue flood. Please drop me a line if you are thinking about using this, and of course, for any suggestions or problems. The author works with India's largest commercial automotive organisation, in the IT division. His technical interest is in the Networking, Information Security, Backup and Virtualisation domains. He is a FOSS follower, and spends most of his time learning Linux internals. 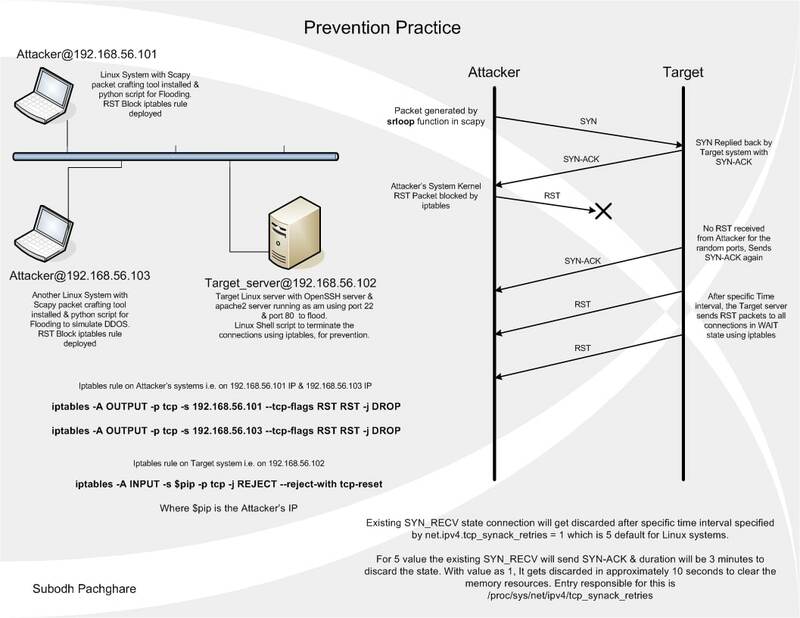 Its a very nice work by you…Really interesting & valuable to prevent DDOS attack…. I have been searching for something like this for a long time. I’m gonna give it a try on my servers , since ddos floods have caused alot of hassle lately, and most firewalls are simply too heavy for the purpose and are exhausting all resources themselves by trying to mitigate the attacks, which eventually brings the servers down anyway. Can you help me to set up the server and clients? Do you still need assistance? I think I can help. Well, yes I can help you with it, but I suspect it won’t help you. The kernel doesn’t use a “learning system” for two reasons: 1) it doesn’t have the resources to do something like that and 2) it doesn’t need to. It is sufficient to have some sort of threshold and if the threshold is exceeded then stop accepting connections. Technically, if the threshold is exceeded and the system does not accept legitimate connections, then you have successfully attacked DOSed it. So you don’t really need the slow start. On the other hand, the slow start that you’re proposing intrigues me, so I am going to give you some advice if, in exchange, you will share your results with me in this forum. There is a module called “time” which you can read about for python 2.7 here https://docs.python.org/2/library/time.html or for python 3.5 here https://docs.python.org/3/library/time.html. The scapy call takes microseconds, so you can ignore its execution time for sake of easy calculation. Put the scapy call in a loop, along with a call to time.sleep. Decrease the sleep time with each iteration until you either reach the desired maximum rate or until your victim starts failing or complaining or the NSA shows up at your door. For those of you who are going to complain that I am teaching a Bad Guy how to evil, let me point out that the real bad guys already know how to do this, and they have figured out how to do this stunt using an enormous amount of computer power. I’ve been attacked this way, so I know. I don’t think the slow start is going to make any difference, but if I am wrong, then I’d really like to know. I’m a little confused here. Are you playing offence or defense with your machine learning system? In other words, dies the ML software run on the attacking client or the defending server? Or have I missed the point of what you’re trying to do? 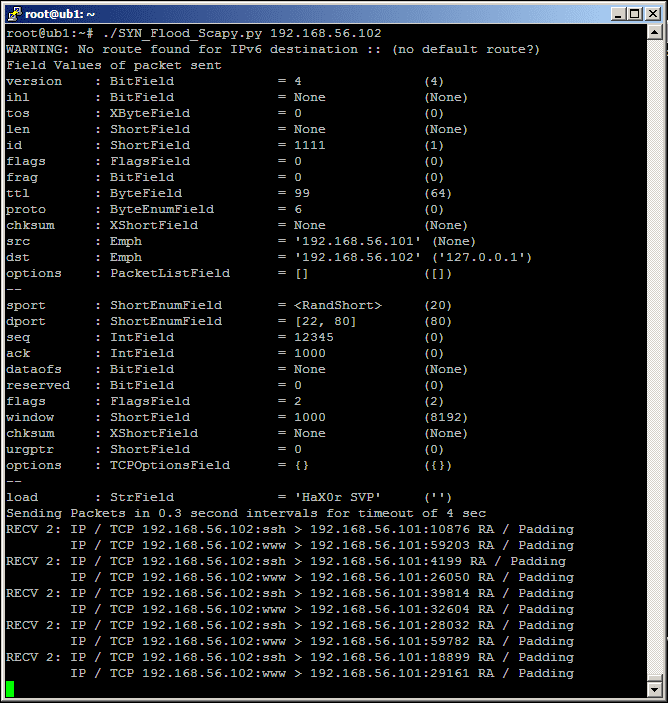 I have run the syn flood script from my vm to windows host. how will i come to know that dos is successful and my windows host can not receive any more packets. This article must really helpful to (D)DoS researchers. However, now a days most of the commercial UTM/firewall devices and Linux supports TCP SYN Cookie and its more effective in mitigating DDoS attacks.